GreenBuzz Sustainability Lab Neukölln – Clean Air, City Compost and Vertical Gardens - GreenBuzz Berlin e.V. 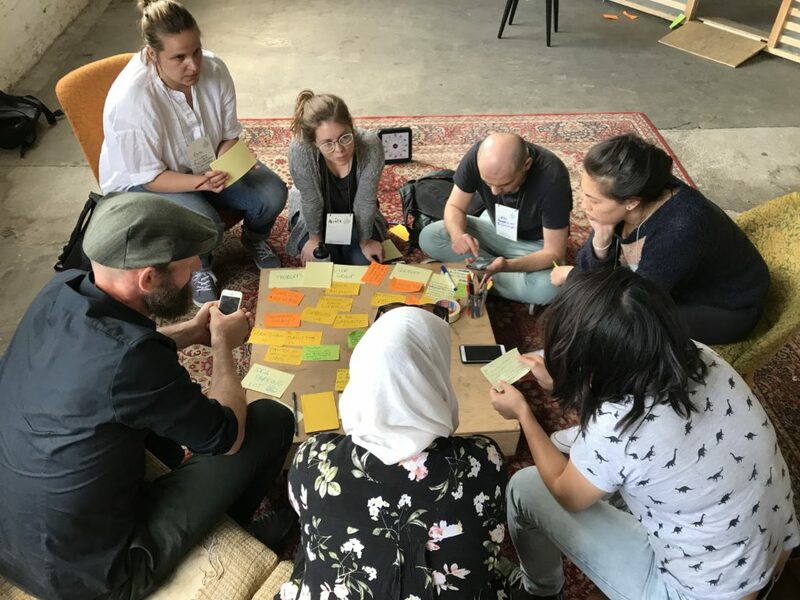 On July 1st 2018, about 20 people came together for the second GreenBuzz Berlin Sustainability Lab at CRCLR in Neukölln to jointly work on three challenges that have been proposed by active members of the GreenBuzz community in Berlin. 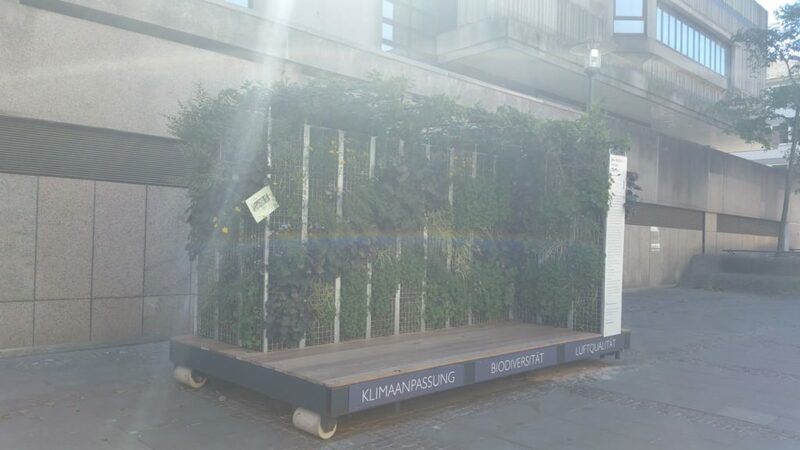 Challenge 1 – Hydroponic Vertical Garden: There is a lot of bare walls in Berlin, 4 stories high, no windows, vast useless emptiness. Until now. Let us use this space to automatically grow plants in vertical gardens, eat CO2, clean our breathing air & create a canvas for natures wonders. Can Hydroponics (water bath instead of soil) ease the environmental control and enable us to create new concepts of vertical gardens? This challenge had five participants. It was run by Felix Hofmann from ImagineCargo and facilitated by Aurélie Ferron from Protellus. Challenge 2 – Saubere Luft e.V. is going to be a community platform to support specific local actions and goals in reducing air pollution in Neukölln. The air in many of our streets is heavily polluted and hazardous for health and well being. The goal of this challenge is to bring the value of clean air to the top of everyone’s mind and brand “saubere Luft” (clean air) as a human right by founding Saubere Luft e.V., as well as by taking action for more space for bicycles and pedestrian and how to increase the number of electric busses, cars and bikes. This challenge had 5 participants. It was run by Frederik Henn and facilitated by Fenja Jensen. Challenge 3 – Zoo Compost Stations: An experimental station is transforming food waste into high-quality bio-eggs, protein and compost. This pioneering initiative in Europe is able to manage 50% of the total municipal waste in the same neighbourhood where it is produced. No trucks, no incinerators, no CO2. 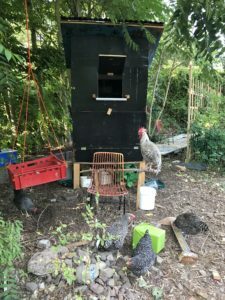 In this challenge we want to find out how this system could be utilised in Neukölln to support a Zero Waste lifestyle in the city and to exchange waste for eggs. This challenge had 4 participants. It was run by Ricardo Beck and facilitated by Amy Buer. We will describe the process and results for each challenge in the following. 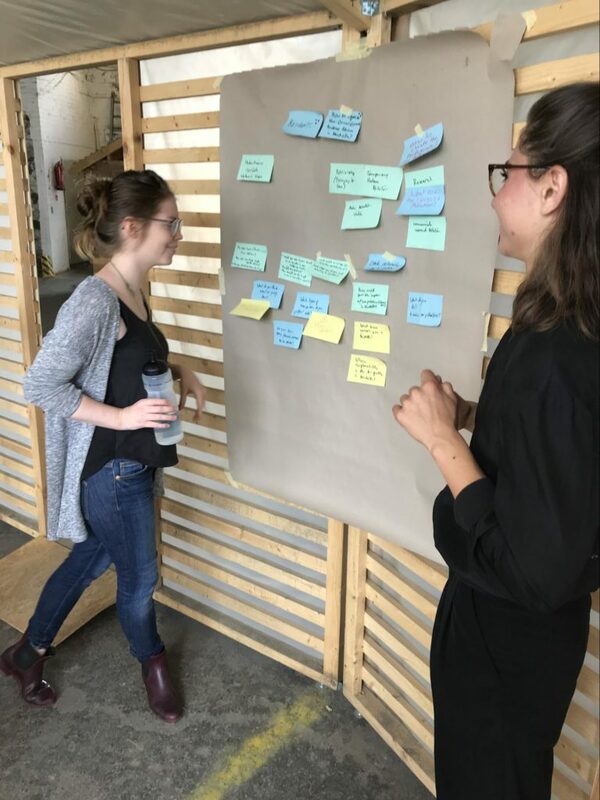 In the Hydroponic Vertical Gardens workgroup the team started with a discussion of the positive effects of plants in the city like: noise-reduction, shadow-generation, fine-particle reduction, evaporation chill or CO2 reduction at the place of birth. Many ideas like vertical gardens on the windowless parts of houses or other unused city parts were evaluated and brought together with construction requirements, needed permits, financing and most importantly, maintenance costs and efforts of a continuously working system. Interviewing people on the streets brought the insight that environmental issues are only second class and social concerns are currently most important to address in Neukölln. Steadily rising rents, displacement pressure and more tourists as well as short time citizens created a situation in which the neighbourhood is highly dysfunctional, leading to emotions of fear and impotence. Therefor the original idea was adapted to a green social hotspot enriching quality of life and enabling social interaction: a low-cost, low-maintenance vertical park, for a community suffering from bad air quality. A bench with a roof is the central place. A moss wall will shield the passer-by and create some sort of piece island where (elderly) people can take a break, the busy mother can relax, and where people can meet. For a setup like this, green moss is ideal, providing a perfect fine-particle filter, being low maintenance and surviving even cold winters. Solar powered charging stations (like also proposed in the last sustainability lab) allow people to bring their laptops, charge their smartphones and get involved in social interaction while waiting (charging). For this reason, free Wifi was identified as another key aspect of the concept. Ideally, a Kiez Park will be sponsored by a company which may use it for communication with the local people (via touchscreen, product placements etc). 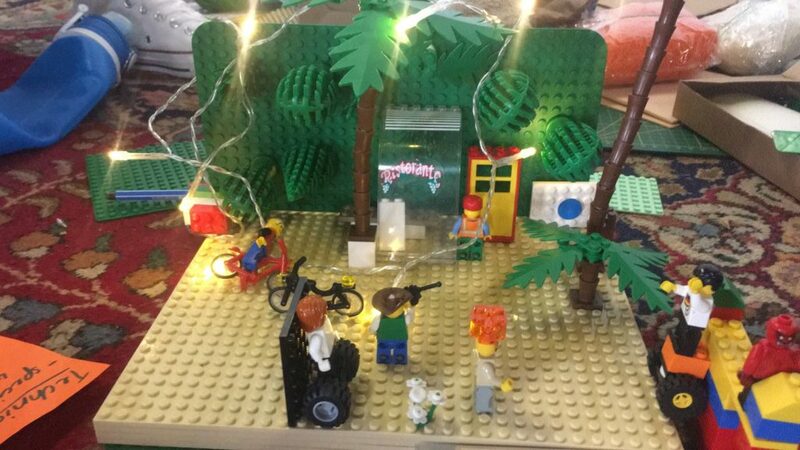 They can also customize the plants on the “green wall” and – in case of local businesses – incorporate the Park into their daily business. As a next step, the team now aims to build a functional prototype. Crucial for the project are also a marketing and financing plan as well as further research regarding similar projects like “mobiles grünes Zimmer” already does something similar (in Darmstadt) or “GreenCity Solutions”, a Berlin-based startup producing moss walls. 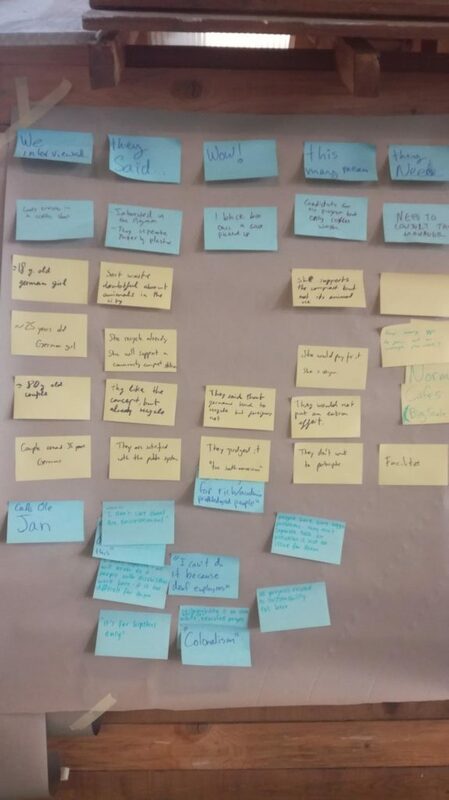 Based on the idea is to create awareness in Neukölln for clean air, this group discussed the need for awareness in the general population. People do not know the air is polluted, therefore attention needs to be created and education is needed. Do you know how bad the air pollution in your neighborhood really is? We rely on expert advice, which is scarce. Collaboration with other groups who share similar goals is key to learn best practices, be it in Neukölln or world wide. According to the feedback collected from locals in the neighborhood, most people are somewhat fed up with dirty/polluted environment but are not aware about the dimensions of the problem. Exhaust fumes from cars and trucks are perceived as a major annoyance and health risk when cycling the city, which has also been recognised by others like Netzwerk Fahrradfreundliches Neukölln. 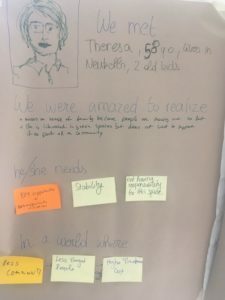 With those findings in mind, the group decided to take action and form an initiative to promote “Saubere Luft in Neukölln”. As first steps, an award will be given out to the most polluted street in Berlin with an open invitation to press and other active groups. Furthermore, signs reporting the current level of air pollution will be put up at central spots in Neukölln. Through this raised awareness the initiative will motivate people to use bikes instead of cars, but we also hope to increase pressure on decision makers for greater bicycle lanes and less traffic, so to reduce the amount of emitted co2. In the starting phase, Ricardo Beck explained the idea and an already existing prototype in Prenzlauer Berg in detail, focussing on the benefits it has in relation to the traditional waste management systems. 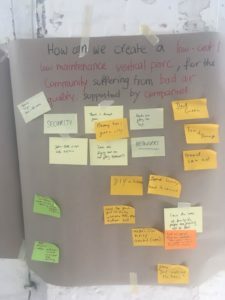 The following brainstorming session explored the questions of the current status of the project and especially how to engage citizens and neighbors to participate in the donation of their waste, as the group decided this was the most important aspect for the long-term success of a Zoo Compost station. After the brainstorming, the team took out the key questions to be answered by two possible target groups: citizens and local food shops (cafeteria and restaurants) and went to the street for interviews. In summary, there was a general interest from all interview participants, but feedback varied depending on the knowledge and background. In conclusion, it was estimated that 1~5% of the population will value the project by understanding and caring about the environmental benefits that are involved. With respect to the CO2 reduction goal of the Sustainability Lab, the reduction of carbon emissions into the atmosphere is not the only significant environmental benefit of the project (soil nutrient balance, fertility, anti-desertification and community resilience are other benefits), as the project also contributes by developing cleaner composting processes (less methane) and by reducing truck travels, as less waste is generated in the neighbourhood. 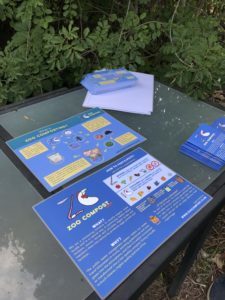 As a next step, an info campaign will be developed, starting with an invitation for the residents of the garden where the Zoo Compost station is located to a community party. This allows the demonstration of the prototype and the processes behind, the benefits of the concept and to invite them to participate, either by donating their waste or by volunteering to maintain the station. By finding a sustainable system for participation in the area around the existing Zoo Compost station, they will be able to build more Zoo Compost stations in other locations and use the best-practice insights they have gained to easily foster community participation in new areas. The event was on July 19th, at 19h, in Peace of Land. Communication material was given out to ensure that no one would leave the party without understanding 100% how the station works. Based on these results, we are now working on the first prototypes together and continue to follow and support the groups throughout the process. 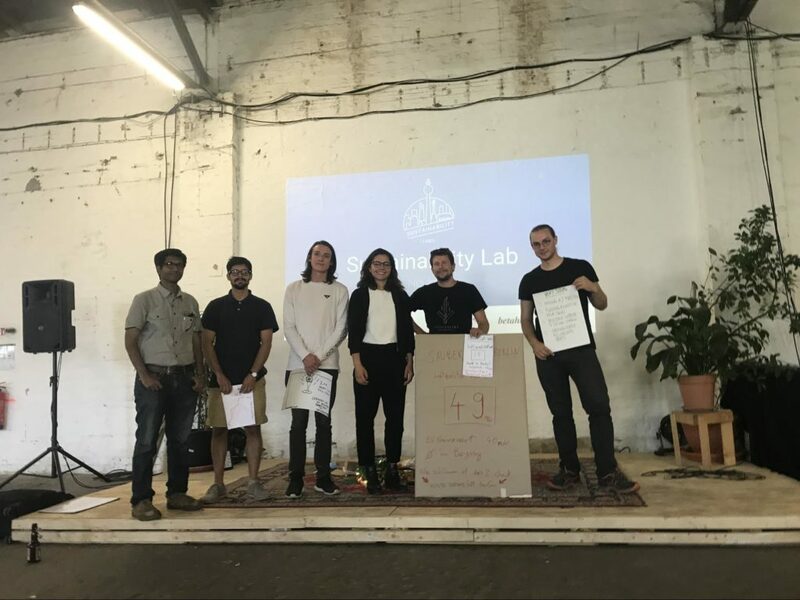 Involving and informing the public about these projects as well as additional projects following from the upcoming Sustainability Labs in Wedding on September 15th are a core responsibility of GreenBuzz Berlin in that regard. Please get in touch with us, if you are interested to put out a challenge for our next lab or if you would like to participate in a lab to make your own Kiez more sustainable. All information about upcoming events and challenges can be found at https://greenbuzzberlin.de/sustainability-labs/ and on our facebook page at https://www.facebook.com/greenbuzzberlin. The Sustainability Labs are funded by Bundesministerium für Umwelt, Naturschutz, Bau und Reaktorsicherheit aufgrund eines Beschlusses des Deutschen Bundestages / Funded by the Federal Ministry for the Environment, Nature Conservation, Building and Nuclear Safety due to a decision of the German Federal Parliament.